These are my famous pancakes – packed with vegetables and gluten-free – and are fun, healthy, and delicious! Grate the zucchinis with a box grater. Place in a strainer over a bowl and sprinkle the salt on top. Mix it around a bit and let it sit for at least 20 minutes to bring out the water. Don’t skip this step or else the pancakes will be watery and will not stay together. In the meantime, peel and chop the carrots and onion and grate in the processor. Make the flax egg by whisking together the flax and water. Set aside. Using the back of a fork, press the zucchini against the strainer to press out the as much water as you can. 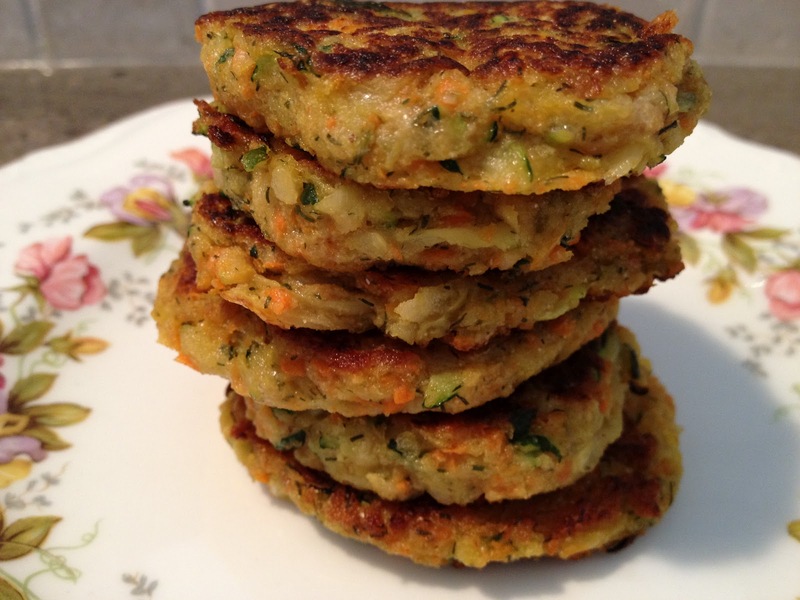 In a new bowl, combine the zucchini, carrots, onions, flax egg, chickpea flour, baking powder, and dill. Mix well. Heat up sunflower oil in a non-stick skillet and, using a tablespoon, form little pancakes. When the edges are brown, flip them over and flatten them a bit. Drain on paper towels. Enjoy!